Pet Chauffeurs provide Caring Pet Transportation service throughout Europe. 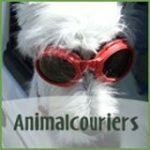 Pet Courier Pet Travel to the Algarve and Transport Animals from Rescue Shelters. Quotes and price list at our website, PayPal accepted for all of our services. View the gallery at our website of actual vehicles we use to transport animals.